Who hasn't been influenced even just a little bit by the Wu? This album is so simple and easy to digest, yet packs such a huge punch with its gritty streets-of-New-York story-telling, and raw 'creaky-old-piano' sampling that 15 years after its debut it's still better than 90% of the hip-hop coming out today. At least 6 of the 9 Wu members are incredibly solid story tellers, making the fact that you've never been to the Bronx, or never seen a shorty's blood "all over the hot concrete" fine. You don't need to be a gangster to have the Wu make you feel what it's like to be a gangster. 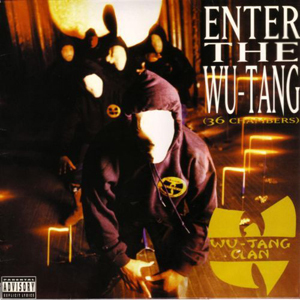 The Wu brings you into the Big Apple, and into their lives in The 36 Chambers. This is one of the most essential hip-hop albums ever made. Download it for free here, then go out and buy the other 300 albums the Wu and their associates have put out. Other great Wu-Tang albums include Raekwon's Only Built 4 Cuban Linx, Ghostface's Fishscale, GZA's Liquid Swords, The Wu's The W, and a whole load more. There are so many by now it's silly.